Update: 03-01-06 6:41 pm – No, there’s no car wash across the street. 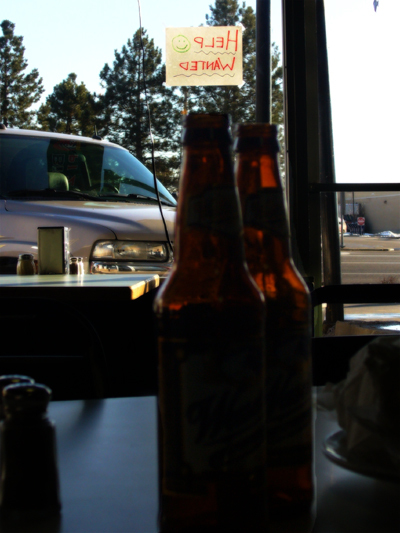 This was taken at Big Apple Pizzeria. I did a review of them for Starling Travel, but this picture was just for me. When the Starling Travel entry posts, I’ll include a link here. I wrote about a way of eating that has helped me get off my plateau that I had been on for about two years. It involves eating more calories on the days that I exercise and eating less on the days that I don’t. I’ve been zig-zagging for a couple months now and it has really helped me stay away from bingeing and keep my eating healthy. 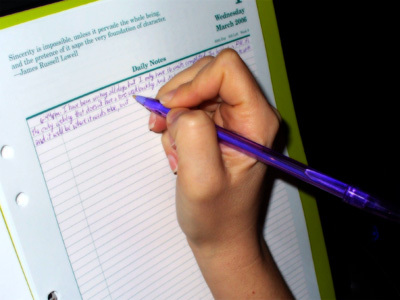 Last month, I thought, what if I zig-zagged with my writing? To keep afloat, I need to write 35 entries a week. To start building up my two-week backlog, I have to write at least 50 units a week. I wondered if I could write every other day and be able to write more than I did when I was trying to write every day. Writing every day would consist of writing 10 entries a day, which is a lot. Writing every other day, would consist of writing 15 units on Monday, Wednesday and Friday and fitting in 5 more units somewhere. Could I do it? The answer was amazing to me. Not only could I easily write 15 units a day when I knew that if I did I would get the next day off, sometimes I’m able to do it by noon. They key to it all is the reward of having a day off. I was unable to do 10 units a day before, but suddenly, I am easily able to do 15 or more a day. The essential thing for me is having a complete day off inbetween. After writing, I really need a rest and zig-zagging helps me with that. Of course, something inside of me thinks that if I can write 15 entries in a day, I should be able to write 15 units every day. I think I could do it for about three days in a row, but afterward, I would need to rest for two weeks. I don’t know what my limits as a writer are yet, but I’m willing to see much I can do. 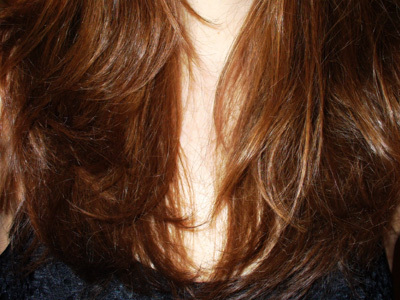 For now, I’m zig-zagging. “Damage,” that’s all the window said to me. 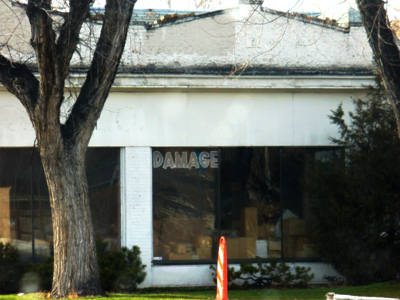 I vaguely remember there being a store there that sold freight damaged goods, but all that was left was, “Damage.” I grabbed my camera and clicked the picture through the window of the Beetle, willing to live with any impurities on my windshield in my photo. It sounds like the name of a character who comes to rough up the protagonist. I’m imagining him with a Bristish accent. I must be remembering something from some bit of fiction in my past. Does anyone have any ideas? I have been over-dosing on music lately. I purchased a bunch of CDs that I haven’t really listened to more than once apiece. I feel a little guilty for not listening to them more and I’m worried that I bought them because I like to have new music available to me, instead of actually wanting each album on their own merit. I’ve enjoyed all the albums that I have bothered listening to. It’s not like they have disappointed me. It’s just that I feel like I’m neglecting my new purchases by not listening to them more. I only have so much time in my day and with writing and exercise, I have little else at the end of the day except sitting. I can’t listen to music while I’m writing, so I end up only listening when I exercise, and even then the music has to compete with the movies that have arrived from Netflix. I almost feel as if I’ve personified the CDs and given them human traits and feelings. Kelly Clarkson is pouting on my desk because I only listened to her once. I didn’t even listen to her actual CD. I just ripped it and listened to it on my Treo while I ran on the treadmill. Ultra Dance is strutting around like a pimp because I’ve listened to it more than the others. Those Grammy Nominee albums are sulking because I haven’t actually listened to either of them all the way through. I guess it doesn’t matter if I listen to them or not, except I feel like I’ve wasted my money. I guess I should have borrowed them from the library. I should have taken a picture of it. My words are not nearly descriptive enough to fully illustrate the purple fondue. Mike and I first made it months and months ago. We decided to make fondue at the last minute and the only wine we had was a tiny individual serving bottle of cabernet sauvignon. The fondue was purple. 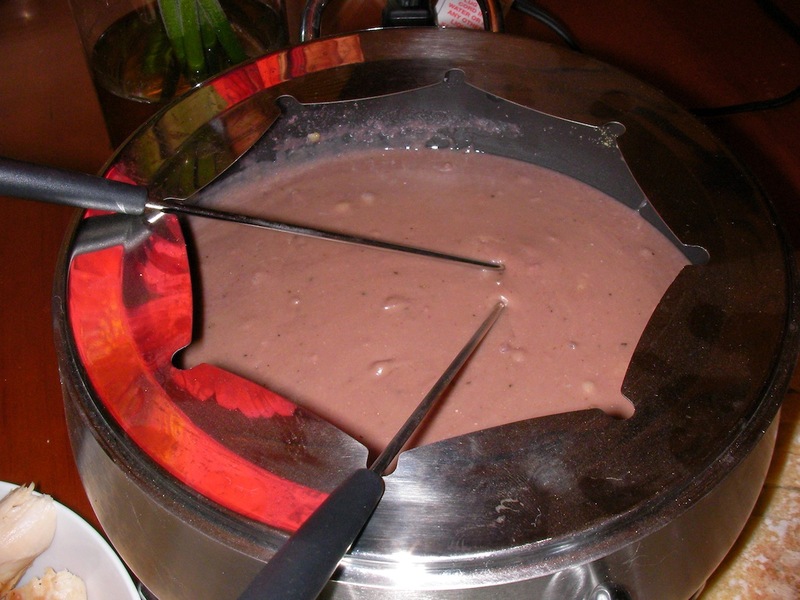 Not burgundy, or a healthy color of a dark wine, the fondue turned out grapety purple. It looked like Play-Doh, but it tasted delicious. The peppery undertones of the wine accented the cheese and garlic beautifully. Mike and I ate the whole thing happily despite the color. We kind of forgot about the purple fondue for the next few months, but when Mike asked me what I wanted for Valentine’s Day, I told him I wanted to stay home and make purple fondue. We used the leftover half of bottle of cabernet sauvignon from the Halloween party and it was perfect. It was so good, we decided to have Stacey and Dan over to feed them purple fondue. That was the only negative thing that was said because after they tasted it, we kept eating until it was gone. Carrots, cauliflower, apples and three types of bread all happily dipped into the purple goo. The house smelled like garlic, wine, onions and cheese. We talked and enjoyed the food. I don’t know why this hasn’t caught on. 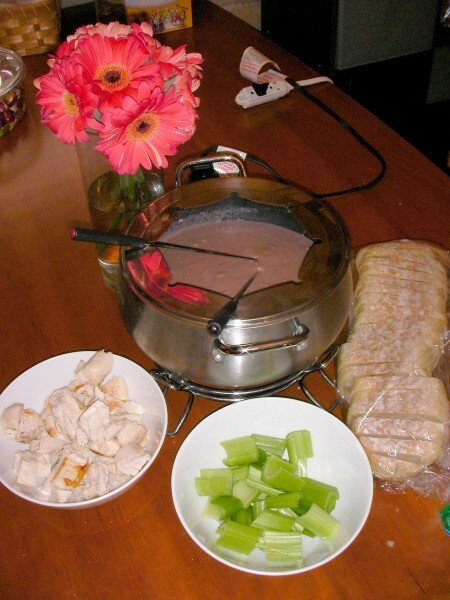 I found one recipe (Red Wine Fondue Recipe) online that calls for a red wine, but the cabernet sauvignon is the best to use with cheese and there is nothing out there. I guess it’s because the color of the fondue looks far too much like purple Play-Doh. Update 04-14-08: Mike made Purple Fondue for my birthday this year and we finally took photos of it. Update 02-02-12: I swear I wrote the recipe down, but when I searched for the words, Purple Fondue, all I got was this entry. Here is the recipe we usually use. On medium heat, melt the butter in the electric fondue pot and add the garlic and onions. Brown the onions until they turn clear and leave lots of brown bits at the bottom of the fondue pot. Increase the setting to high and add the wine to the pot. Stir it around until it sops up all the brown bits on the bottom of the fondue pot (lots of good flavor there). Bring the wine to a boil. While the wine is coming to a boil, add the flour to the cheeses in a large ziploc bag and shake them around until all the shreds of cheese are coated with a fine dusting of flour. Decrease the setting to medium and add the cheese to the boiling wine mixture in small handfuls, stirring with a fork. Keep adding the cheese until you get a thick consistency that bubbles like a Yellowstone paint pot. It will be QUITE purple. Don’t let that stop you. I promise. It doesn’t taste like a grape Jolly Rancher. Once the fondue is thick and bubbling, adjust the temperature so that it keeps warm, but doesn’t burn. Add the green onions and cracked pepper on top and you’re ready to dip in! Purple Fondue has become our traditional Valentine’s Dinner. For the last six years, we’ve had Purple Fondue every year, even when we were in San Diego, visiting Matt and Christy Strebe. We all enjoyed Mike’s lovely concoction. I can’t wait for Valentine’s Day this year! Knitting has gotten a lot of attention lately. There are lots of knitting magazines at the grocery store, whereas two years ago, there was only one. Crochet is still ignored, but knitting is enjoying a comeback right now. I crochet. 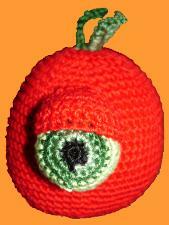 I’ve talked about this before, but I have never crocheted vindictive vegetables. You can download a pattern for the Psychotic Tomato on this website and they are selling a beautiful pattern for a jellyfish. These are some mad crocheting skillz here! I work barefooted almost every day and then wonder why I feel cold all the time. You’d think I’d learn to put on a pair of slippers or socks. Adventure through Inner Space Revisited? A special thanks to Wil Wheaton for directing me to Re-Imagineering. It’s a weblog written by Pixar employees on how they would re-imagineer Disneyland and Disney World. The Disney World stuff is lost on me since I’ve never been there, but I love to read about what they would like to do with Disneyland since it’s such a fixture for me. I particularly liked this entry about how they would love to bring back Adventure through Inner Space. They planned on putting it where Honey, I Shrunk the Audience is currently located. 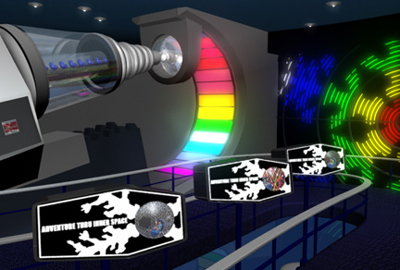 Just like Captain Eo before it, this attraction was passable when it was new and unbearable as the years have gone on. I would love to see the return of ATIS. An updated version that is more accurate scientifically and less psychedelic would be really appreciated. Until then, we’ll have to just watch the Adventure Through Inner Space DVD over and over. I worked so late the other day that I could see the sunset reflected on my neighbor’s house. 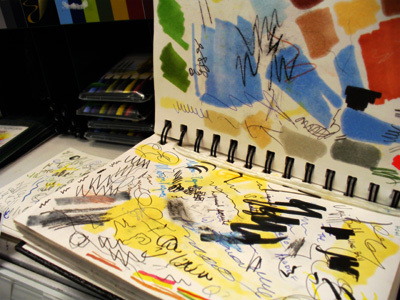 A visit to the art store can be as refreshing as a hot tub in the winter. As I looked out the small window of the plane, I saw big blue and green tents near the airport. “They must be having a party or something,” I thought to myself and tried to imagine what a picture of the tents would look like. By the time we drove past them in the taxi, I was already drunk on the warm and humid air. I could smell flowers and it felt like late spring in Utah. The big blue and green tents were for airport parking, by the way. I guess they protect the cars from the Texas sun. After we got our badges for the conference, we stood in line for the free canvas bag of goodies. I noticed a girl peeking behind the curtain and had this vision of the Wizard of Oz being angered at her impertinence. 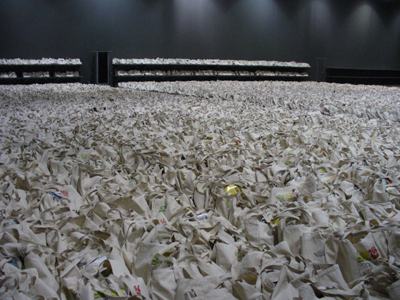 When I took my turn peeking behind the curtain, I saw the rows upon rows of canvas bags waiting for the attendees. We took the trolley to the local grocery store (HEB) and ate at Ironworks. After my plane-sick stomach was full of beef barbeque, we took a twilight walk around the area. The air was full of a thousand bird calls. Every bird call you have heard was coming from the trees behind the Austin Convention Center. 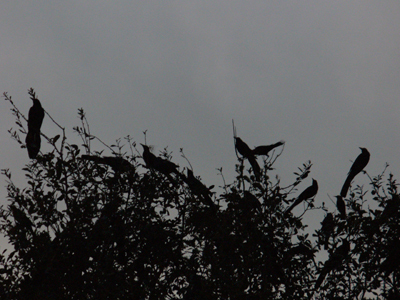 They were full of grackles. The flocks flew past us, singing their stolen songs. We didn’t dare stand under the trees. I don’t know the name of this building yet, but as soon as I do, I will change the description. 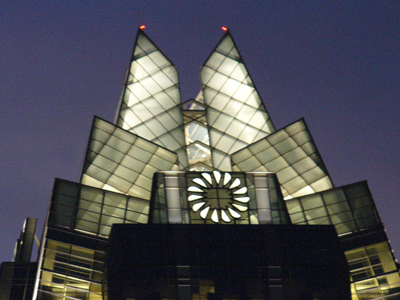 Right now, it’s called the most impressive building in Austin, Texas. Tired from travelling, we sat on the benches outside of the Hilton Hotel, listening to the music coming in from the steak and sushi restaurant. I called my mom to tell her that I had made it safely to Austin and we talked about the conference. “Don’t trust everyone there. Conferences tend to attract scum bums.” I don’t know exactly what she was trying to protect me from, but I thanked her for her advice. 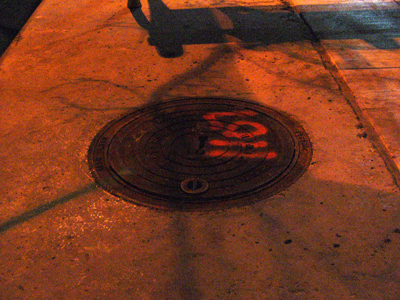 Mike finished his call with his parents and we sat at the bench, staring at the manhole cover. “Brown Eyed Girl” started playing at the restaurant and the two of us kissed. Mike said that my head would be full of new ideas. My brain isn’t quite FULL, but I have a bunch of new ideas and, even better, I have a list of books to read. 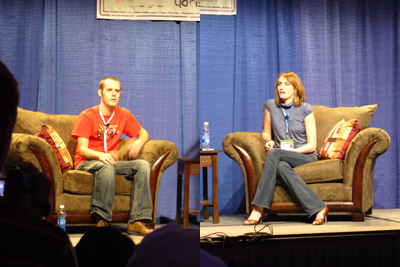 I don’t know why, but I took a picture of the people at some of the panels I attended. I also attended the keynote speech with Jason Fried and Jim Coudal and a presentation from Kathy Sierra (How To Create Passionate Users), but for some reason I didn’t take pictures. I hadn’t heard of any of these people before I came here today, so it’s not like they are celebrities to me, but I did find everything they said interesting and worth listening to. 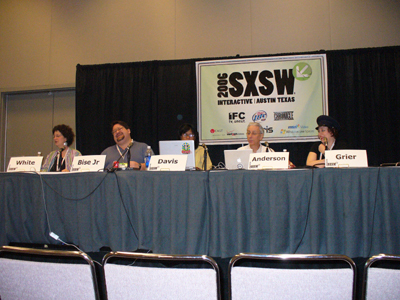 I remember being stuck at work last year while Mike was at SXSW and seeing pictures of the panels on other people’s websites. 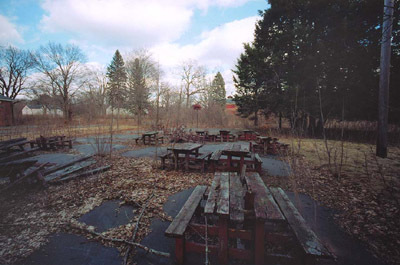 I remember feeling incredibly left out and wondering what the people were saying behind those tables and name cards. Now, I’ve been to the panels and I know what they said. I took eight pages of notes and I write small. I probably should have brought my laptop and typed my notes. Maybe that’s what I’ll do tomorrow. After the conference, we went to find some good local food, but first Mike needed his picture with the Podcast Pickle. 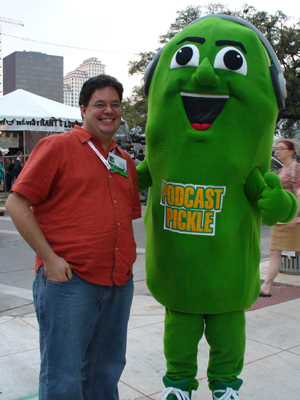 David, would you pose with the Podcast Pickle? on Flickr – Photo Sharing! In Austin… on Flickr – Photo Sharing! Podcast Pickle? on Flickr – Photo Sharing! Scott, another attendee of the last session, came with us in the search for food. We tried to go to Stubb’s BBQ, but the place was packed and had a wait of over an hour, so we walked back toward the Hilton. On the way, we found a Korean restaurant and had an enjoyable conversation about sci-fi and streaming radio. I love to get a new recommendation for sci-fi authors and Scott gave me one: Elizabeth Moon. She has 26 titles at the Salt Lake County Library. That should keep me busy for a while. Thanks, Scott! Today I took my notes on my laptop all day. I have two batteries and they lasted all day for me. They would have gotten even better time if I had remembered to turn off the wireless. I don’t know why, but I was reluctant to cart around my laptop and take notes on it all day long. I felt more comfortable with the paper notes that I took on Saturday than pulling out my laptop and typing. I wish I understood this. My laptop is my sole source of writing when I’m out of town. Why would I be reluctant to take notes on it? The Sink or Swim panel was really helpful to me. Since it’s just Mike and me working on all our websites it was interesting to hear about other startup companies and what they have done that worked and what didn’t. This was a panel that discussed weblogs and enforcing civility on our comments so that the readers are civil to us and each other. They recommended a book in this panel called Choosing Civility. It’s a book of twenty-five rules of how we should deal with each other. I wish everyone on the Internet would adhere to these rules of civility. Civilization doesn’t just happen. We have to enforce it. I don’t require that you wear white gloves when you comment on my website, but you do have to be nice. I’ve linked to Heather’s website (www.dooce.com) several times because of the wonderful glimpses into her life that she has written. When she talks about her fans and how passionate and angry they get at her, I begin to worry about myself. Am I too much of a fan just because I read her site every day and make sure I attend her keynote speech? Am I a stalker? I live in the same city. Does that make me an obsessed fan? Considering how many other weblogs I also read, I guess not. It sounds like her stalker fans need a lesson in civility. When I am writing, there are many times when I say too much. I reveal something to the world that other people might not want revealed. This panel talked about dealing with those issues with your significant other. They had three sets of couples that could answer the questions about how much revelation is too much. The most interesting person on this panel was Dr. Jim Bower, who has run Whyville.net since May 1999. It is a game site online that teaches math and science to children. He shared the statistics of his sites and how it was set up to teach math and science to children 8-15 years old. It has become a popular site for girls ages 10-18, which just goes to show the world how wrong it is about girls. They have their own newspaper that the children submit articles. It was amazing and I could have listened to Dr. Bower talk the whole hour, but he only was able to talk for about ten minutes. Yesterday’s sessions were busy and I didn’t feel like going to the outdoor parties or the weblog awards. We had an enjoyable dinner with a bunch of wonderful people. I have enjoyed this conference so much. I have so many ideas and book recommendations that I can’t wait to get home and start reading. I was taught that if you’re not fifteen minutes early, you’re late. I arrived early and waited for the panel to start. Ever since Dooce’s Keynote, I’ve worried about my appreciation for all the people here. 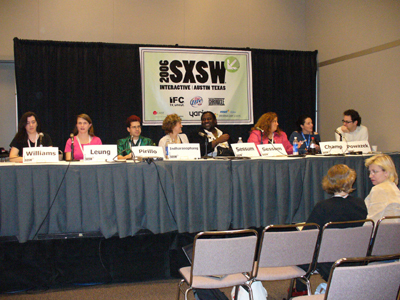 Does it push me into stalker status if I went to this panel just because Maggie Mason was the moderator? Does it assuage my guilt if I actually enjoyed and learned alot from the panel? By the way, I need to learn how to click the camera one-handed without moving my hand. 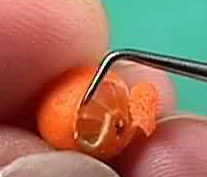 Awhile back, Boing Boing linked to a web site that showed you how to make tiny oranges with polymer clay. They were so realistic looking, that I have been tempted to jump into another hobby. I tried to find the site again, but it is gone. Fortunately, the Way Back Machine has an archive of it. There are a bunch of books that give you step-by-step instructions on how to make realistic looking food. I think people do this for doll houses, but it looks so interesting that I spent 45 minutes in the art store the other day just looking through the books. I went home empty-handed. It looks fun and interesting, but I am full of hobbies. Playing with polymer clay looks like it would be entertaining, but the simple fact is I was fully entertained just by reading the books without touching any clay. Mike was driving south on 9th East in the rain. All the lights were reflecting on the car and the street, so I took the camera and caught as much of it as I could. This was less than a minute out of my life, but I wanted to remember it. I was so happy and the lights were so beautiful. How can such a short time feel so long? I love Gene’s photographs. He takes me to a place that is so different from my wintery dessert. Grocery shopping started out with a bang yesterday. I parked toward the back of the parking lot because the lot was full. The lot is almost always full at Harmon’s, so I tend to just park in the back by habit rather than trying to search for a spot up close. As I pulled the key out of the ignition, I saw a minivan full of girls with balloons and signs. They were cheering and jumping. I thought it must be a birthday party. By the time we walked to the front door, I realized that I was wrong. It wasn’t a birthday party. It’s Girl Scout Cookie Time. Mike looked at me and asked, “How much cash do you have?” I chuckled to myself and offered him all the bills in my purse. We had enough to buy seven boxes. That is basically an infinite amount of cookies in Mike’s mind. 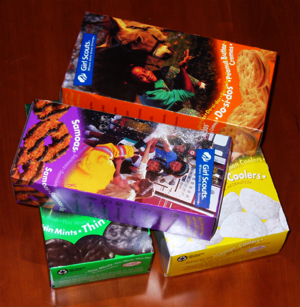 I let him choose to his heart’s content and he bought four boxes. As we were paying, I heard a guy come up and ask a question. I laughed to myself and decided to give the guy a hard time. I laughed and took our boxes back to the car. I’m sitting at Sugarhouse Coffee. I’m here because I’m grieving the loss of all the cool people I met at SXSW. When I woke up in my hotel on Wednesday morning, I had this feeling of sadness. I was sad that the conference was over and that I had to go home. I have felt this feeling before at the end of a good vacation, but this was different. I didn’t want to stay a couple extra days in Austin. What I was grieving was leaving the city. I was grieving every cool person I had met over the previous few days. They were all going home or had already gone home. Austin felt like an empty shell. I sat on the hotel bed next to Mike while he snored away. I pulled out my journal and wrote about the empty feeling in the pit of my stomach. I tried to brainstorm ideas. 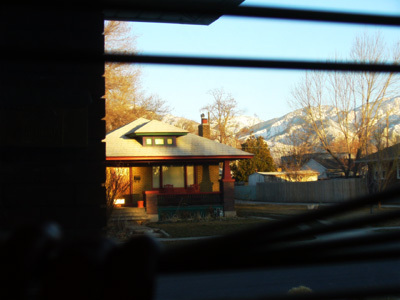 Maybe I could organize a SXSW meetup in Salt Lake City. Sadly only 20 people in the entire state of Utah attended. There weren’t enough in SLC to organize a proper meetup. Maybe I could go to another conference soon. 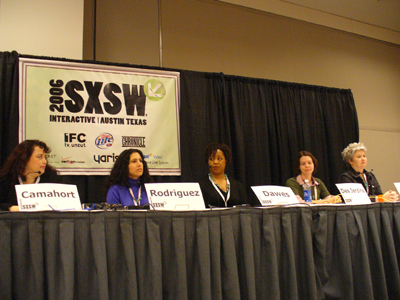 Are there any other conferences as creatively stimulating as SXSW? I had no idea. 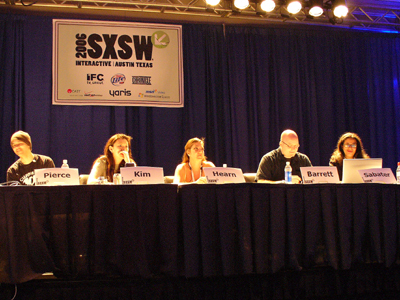 Maybe I could find a tribe of creative people who are just as interesting as the people at SXSW. I have been trying to do this for years and I don’t really have hope for this. So, with no ideas, I just wandered around the hotel room. I packed up our dirty clothes. I checked my email. I read some online comics. I waited for Mike to wake up until I couldn’t wait anymore. I held back the tears as I tried to describe to him the sense of loss I was feeling. His advice helped a little bit. It gets better next year. So, I’m here at Sugarhouse Coffee. I’m writing my entries. 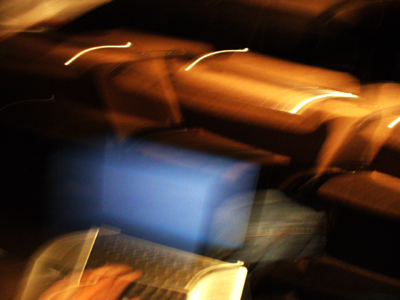 I have been able to do a full day’s worth of work in a few hours by typing my entries to the beat of the indie music. There are noisy people around me and they wear hipster t-shirts, but there is also an autistic guy in the corner rocking back and forth. It’s raining outside, so the kids are all crammed into the shop. I’ve paid for a month of Internet access here, so I can work in the noise and pretend that these people are my tribe. Maybe I’ll collect a group of Salt Lake people just as interesting and energetic as the people I met at SXSW, but until then, I’ll distract myself. 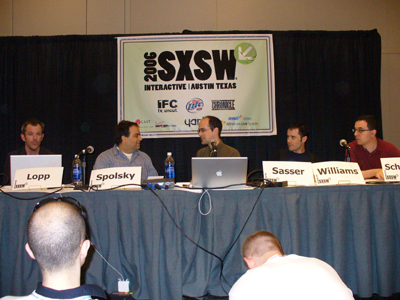 When I was at SXSW, I attended a panel with the fellows responsible for skinnyCorp. They are the Threadless guys who make the cool t-shirts that all those hipster kids are wearing these days. I am always amazed at the willingness of people to create things to solve their own problems and then share them with the world. I have been bothered many times because of needing to scroll a website, but I never once thought of writing some code to solve that problem. My answer was to get a scrolling mouse, which doesn’t really make things easier for me, just one-handed. Every day I write in my personal journal. Sometimes I write before I do any work. Sometimes I write after all the work of the day is done. Other times, I write when I can’t think of anything else to write. 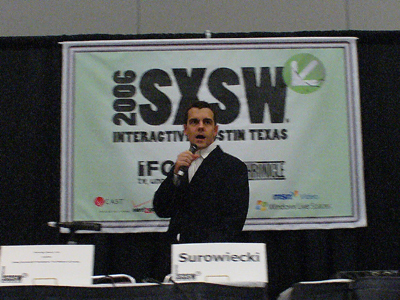 Michael Verdi was another person I saw at SXSW. This short video, Wishbone, is genius. Michael’s father, Jerry, was coming off of the drugs after his open heart surgery and he was waxing philisophical about wishbones. Michael was able to capture it on video. This is why I love technology. If Michael hadn’t had his tiny Sanyo camera in his pocket when his dad started talking, he wouldn’t have been able to capture this moment. I’m just so grateful for the technology that is available right now. I have the same features on my Panasonic and have used it to capture video that has meant something to me. I’m so glad that Michael Verdi was willing to share this with us all. This boat is older than I am, so I can’t claim she was named after me. I do hold a page of Google search entries before her, though, so I can’t be jealous. “Laura Moncur” the former Buckie Lifeboat, built 1961 and sold by the RNLI 1988. with 4berth cabin forward accessed through engine room or from maindeck. Galley / saloon aft. Central wheelhouse with radar, radio and navigation equipment. Twin Gardner 5LW diesels with all the usual lifeboat refinements. 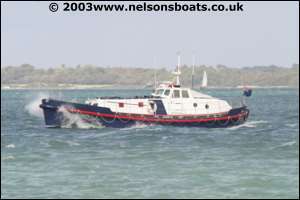 This boat has been excellently maintained by its owner and has had annual out of water re-fit, June 2005. including complete repaint. She is ready to be enjoyed by the next discerning owner. 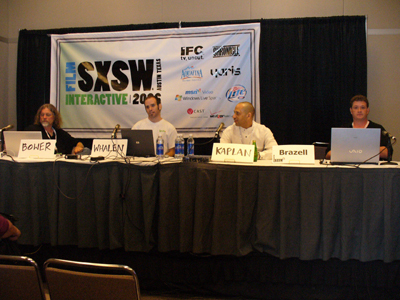 Another person I met at SXSW, Amy, writes MommyBrain. This entry really touched me. When my grandma died, Stacey and I cleaned out her personal items because it was too hard on my grandpa to do it. At one point, I opened a drawer full of silky and lacy underwear. Every item still had the tag on them. I knew that my grandma had been saving those beautiful underthings for a special occasion. She never got to wear them. Since that day, I have been the kind of person to use all my pretty Post-It Notes, fancy soaps and smelly candles. I never want to have someone else clean out my drawers and find that I never got to use my best stuff. I still have my original library card. I was in the fifth grade when I got it (ten years old). 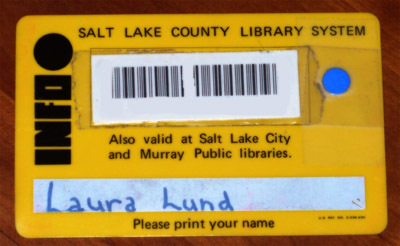 My name was printed in clear letters on the signature line, “Laura Lund.” I can tell it was fifth grade because I had changed over to the more formal style “a”, but I hadn’t learned how to write it easily yet. It’s funny how personal archaeology works. The blue dot means that I can check out books at the Salt Lake City Library System as well as the county libraries. I use the Salt Lake County Libraries much more than the city system because their website is so darned convenient. I can look up books, DVDs and music online, put it on hold and the system will call my cell phone when they are at the library waiting for me. I hardly ever just peruse my local branch anymore. A visit to the library has become a quick run in, grab my items from the hold shelf and a check out. I love this old card because it’s so easy to spot among the plethora of client loyalty cards that I am now required to cart around. Their new cards are plain, blue and white atrocities that look like a health insurance card. They are completely unremarkable and easily forgettable. I’ll keep my bright yellow card, even though it’s over 25 years old, for as long as they let me. I just heard the news that the actor who played G’Kar on Babylon 5, Andrea Katsulas, died on February 13. He was only 59 years old and died of lung cancer. Babylon 5 was a science fiction television series that I have a love/hate relationship with. I LOVE all the characters and I truly enjoyed watching for the first three seasons or so. After that, however, all the characters were so embedded in treachery and suffering that it was difficult for me to watch. When G’Kar lost his eye to torture, my heart ached. I never finished watching the series, even though we had video taped them all. Our local station was so difficult to get a clear signal with an antenna that we subscribed to cable because of Babylon 5. My sister, Stacey, consumed the entire series over the course of a few months by borrowing all our old VHS tapes. I didn’t know this when I started adding video to my weblog and it’s not like the couple of videos that I uploaded were worth anything more than a memory for me, but I wanted to spread the word. You should also check the terms for Google Video, Yahoo Video and AOL Video before using them also. Now, how DO you add video to your weblog without letting big corporations own them? I found these tools very helpful to get me past the fear of putting my own video on my weblogs. Stay tuned for video glimpses into my life. Last Friday, Mike and I went on a date, so I straightened my hair. It’s naturally curly, so the process takes about 30 minutes. I feel like a different person when I straighten my hair and I always vow that I’m going to do it every day when I see how shiny it looks. Last week I took a walk around my neighborhood. On the corner of 900 East and 1300 South, I crossed paths with this person. 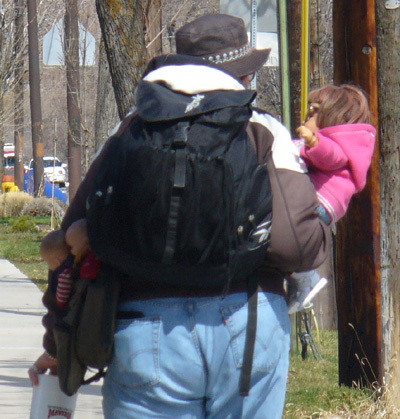 I don’t know if you can tell, but he was holding one large doll and had three smaller baby dolls in his messenger bag, slung over his shoulder. He looked a little too clean to be homeless, but he had that air about him. I felt like I was walking through his living room. As I walked past the NuCrisp Popcorn building, I noticed something different. Someone had cleaned up the clutter in the store. 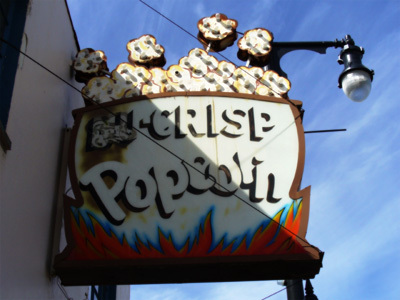 For the last few years, the NuCrisp Popcorn building has been used to store someone’s treasures. Of all the clutter, the only thing I remember is an original Strawberry Shortcake toy in its box. The other day, however, it was gone, along with much of the other clutter. Someone had arranged the wall with hooks and hung gift bags on them. A wide assortment of gift bags in many colors and sizes. I was struck with panic. Someone was cleaning up the NuCrisp Popcorn building and were going to use it for something. To me, it didn’t matter what the something was going to be. 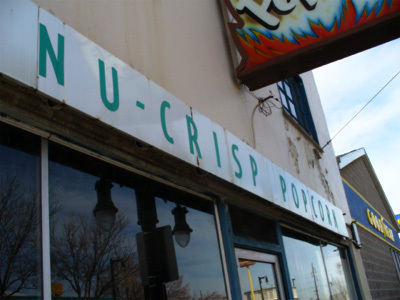 The sick feeling in my gut was telling me to hurry and take a picture of the NuCrisp sign because soon it would be gone and all that would be left is some bland store with a backlit awning. 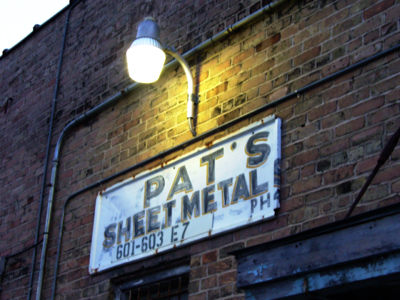 Something about me truly loves the old neon and light bulb signs that were so popular in the late fifties and early sixties. Every marquee that is taken down is an ache in my heart. I suspect we’ll be losing the NuCrisp Popcorn sign soon and all that will be left are my photos. Apple, The King of Orginal Design, Looks…Um…Like a Copycat In Its New Ad. After creating the corresponding commercial clips and reducing them so much in size, they DO look very similar. After watching each commercial, however. the Eminem/Apple commercial is so much more inspiring. Do you want to know why? Eminem’s “Lose Yourself” is such an inspiring song that the similarity between the two commercials fades very quickly. Isn’t that what Apple was trying to say anyway? Let’s get serious, though. Can Lugz really make a claim on earth tones, breakdancing, and spray paint?